The photographs are what remain of the life that once was on the Quinney family farm in Wisconsin. The objects portrayed in the photographs have an afterlife, a life for the seeing, a life different from their original purpose and function in a former time. The objects may be gone, the landscapes may be altered or have disappeared, but the photographs and the few words written about them and the experience of photographing remain, until they too vanish. In this transient world, we live and have our being, for our time here on Earth. 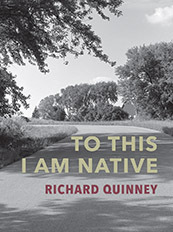 The author, Richard Quinney, is native to that time and place, to what can be seen in the images that he made once upon a time at the family farm in Wisconsin.